One of my hopes for this walk was that I look at everything with an open mind; to observe what is going on in the place I live without judging it too much. As someone who prefers to be on foot or on bicycle and spend as little time as possible thinking about cars, this presents a special challenge. I may be on foot, but I am surrounded by cars wherever I go on this walk. Regardless of my feelings about them, I have found that I have been able to make plenty of observations about the cars here in Berkeley. Compared to most other places in the Bay Area (where I have lived most of my life so far), Berkeley is a very easy place to get around without a car. Bike lanes and bicycle boulevards cut through most of the city. 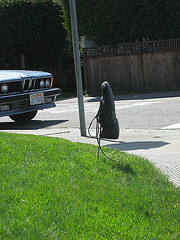 With the exception of some places in the Berkeley hills, sidewalks can be found in most places. In the hills, a series of stairways and pathways makes traversing the area much easier. Three BART stops and the bus lines will take you most places in and out of town. When I first moved to Berkeley I had the impression that there might be fewer cars on the road compared to other cities in the Bay Area. This has not been the case at all, nor has it been the case that drivers are any slower or more patient than anywhere else I have walked in the area. It is no surprise that one of the more predominant cars on the road here is the Toyota Prius Hybrid, as it is in many upper middle-class liberal areas of California. But the Prius can be found parked in front of houses all over town here, from the million dollar homes in the hills to run-down fixer-uppers in working class areas. 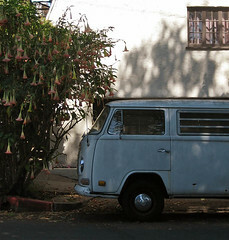 Although there are few remnants of the 1960s left in Berkeley, I have seen a surprising number of VW Buses and Bugs. Berkeley has a biodiesel fueling station and a biodiesel collective, and converted 1980s Mercedes (and a few VW Golfs) can be found here. But there are also plenty of other SUVs and even the occasional Hummer here. I would not go so far as calling every-street walking in Manhattan to be a trend, but there appear to be more people who have walked all of the streets of this New York City borough than anywhere else. If I lived there I would walk every street as well. Last year I was in New York for a week and walked all day long every day I was there, throughout Manhattan and a bit of Brooklyn, and felt I had barely scratched the surface of this place. The walker who most inspired my Berkeley walk was Caleb Smith. His walk was written up in the New Yorker and documented on his website. Mike Epstein, who runs the photoblog Satan’s Laundromat, was inspired by Smith’s walk. On Flickr, you can follow the journeys of the everystreetinmanhattan walkers. Manhattan is huge. But then there are the other boroughs. Gary Jarvis probably has the right idea for attacking Brooklyn: he is running every street there. John McNamara, who wrote a number of books on the Bronx, including History of Asphalt: The Origin of Bronx Street and Place Names, apparently walked every street in the Bronx (and canoed or kayaked every waterway there) in his time. Staten Island and Queens may not seem to some people to be the first place to walk, but both of these places appear to have many hidden surprises for walkers. If you are inspired to walk in New York City, Forgotten NY has an amazing (and overwhelming) amount of suggestions for things see, including historical buildings of all sorts, abandoned theaters and hospitals, amusement park remains, old signs, street lamps, hidden alleys, and more. Although I have not yet walked every street in Berkeley, I feel pretty confident saying that the thing I am most grateful for as a walker (and cyclist) in Berkeley is the I-80 bicycle/pedestrian bridge. The bridge starts at the west end of Addison Street and connects the rest of West Berkeley with the Berkeley Marina. Without this bridge, walkers and cyclists would not be able to safely access the boat launching areas, the UC Aquatic Center (which rents sailboats, kayaks, and windsurfing equipment), the Adventure Playground (where children can use tools and build things), Shorebird Park and Nature Center, the public fishing pier, Cesar Chavez Park (which is the site of the annual kite festival, and which includes an off-leash dog area), and other attractions. The I-80 bridge also connects with the Bay Trail. When completed, the Bay Trail will encircle the San Francisco and San Pablo Bays and connect all of the Bay Area counties. The Bay Trail has been under development since the 1980s, and will probably continue to be for some time before it is completed. In the East Bay, however, there is a nice stretch of the trail from Emeryville north through Berkeley, Albany, El Cerrito, and Richmond (with a short gap through Golden Gate Fields race track). The great thing about both the bicycle/pedestrian bridge and the Bay Trail is that together they allow you to parallel the route of I-80, which has regularly been at the top of most lists of the worst commutes of the Bay Area. The photo above shows the view from the top of the bicycle-pedestrian bridge looking down on I-80 heading towards the San Francisco Bay Bridge, with the frontage road and the Bay Trail path to the right. One of the easiest ways to get recognized as a tourist in an urban area is to stand on the street looking up — at monuments, skyscrapers, churches, and other buildings. And we look up for good reason; there is much to see in the way of architectural details, signs, lights, and more. This is only part of the picture, though. Earlier this year, during the centennial of the 1906 San Francisco earthquake and fire, the book group to which I belong chose to read Herbert Asbury’s The Barbary Coast. A few of us decided to walk the entire Barbary Coast Trail, a historical route through San Francisco. Joe took photos of all 160 or so monuments along the way, which are embedded in the sidewalk to lead you along the route. 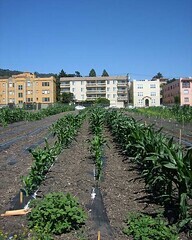 The route, which we walked over two weekend days, winds through the most popular tourist neighborhoods of San Francisco. We did not see anyone else noticing the monuments, and we received more than a few quizzical looks from people wondering what we were looking at. Manhole Covers, by Mimi Melnick and Robert A. Melnick, contains photos of all sorts of interesting manhole covers in the U.S., along with a historical essay on the topic. This book has inspired me to look at manhole covers in my area, and also to think about other things I can find by looking down. What other grates and openings are down there besides manhole covers? What sort of engravings can I find in the sidewalk (official imprints, initials placed when the cement was wet, street names in another language). What sorts of devices have been used to contain street trees and which trees are cracking the pavement? How are the sidewalks designed or are there sidewalks at all? Are there steps that lead down to another building, courtyard, or underpass? Do the buildings where I am walking have basements? Is there evidence of old train tracks? Are there any interesting items (notes and lists, photos, for example) that have been dropped on the ground? What else can I find?